Lie down prone (facedown). Separate your feet about one foot. Place your palms beside your chest. Keep your fingers straight, spread apart, and pointing ahead. On an exhale, push into the floor and lift your body up. Straighten your arms, lift your hips, and move your head towards your feet. Place the crown of your head on the ground and stretch your upper back into extension. Keep your legs straight and strong. Press your heels down without bending your knees. Keep your feet parallel to each other. Remain in the shape with deep breathing for 60 seconds. To exit, lift your head, move your torso forward, and lower down. I have chosen to demonstrate a more common modern down dog here. The version Iyengar shows is incredibly challenging for most practitioners to perform and requires great openness in the ankles, calves, hamstrings, hips, spine, shoulders... everything really! In the more moderate version I'm taking, there is less of a backbend emphasis and more opportunity to vary and explore different elements of hand and foot placement, etc. This version encourages practitioners to develop the proprioception and interoception to create balance and symmetry without a clear mobility-based goal (head and heels to the floor). 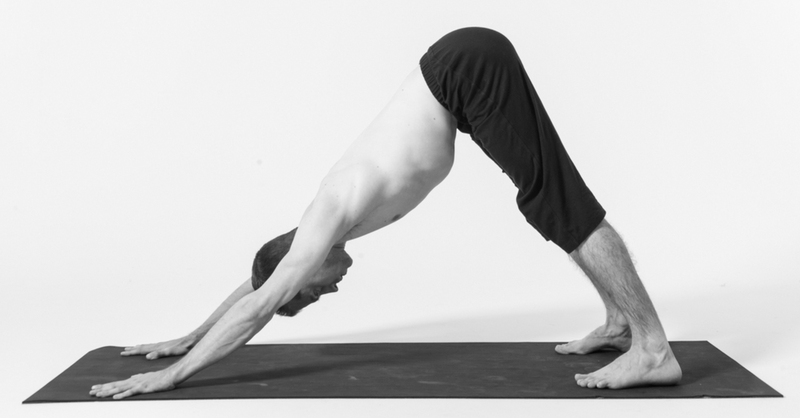 This version is also the most common jumping-off point for poses and sequences in many contemporary vinyasa styles. The length of my pose is shorter and my hands and feet are wider than Iyengar's. This creates more space and stability in the shoulders, hips, and hamstrings. My shoulders are in full flexion; Iyengar's are in extreme hyperflexion. Some teachers will say this is unhealthy; I don't think it has to be. I can perform the variation Iyengar is demonstrating here in a way that feels very healthy and beneficial. However, it takes lots of strength, awareness and training to do it. I recommend studying this posture with a teacher who truly understands the mechanics of the shoulder girdle (and that's actually not most yoga teachers).